Accessory Genie - Consumer Electronics and Accessories Industry News: Who says you can't be small and intelligent at the same time? Who says you can't be small and intelligent at the same time? The United States is cracking down on people who talk on their cell phones while driving. According to Hands Free Info, 39 states have banned texting while driving, and, surprisngly, only 10 states have prohibited using a handheld device. Nonetheless, all those states have allowed hands-free calling. It makes sense as we all know that holding a phone while driving can be a bit distracting. Invest in this little guy, GOgroove SMARTmini BT, and you'll be on your way to hands-free calling! Do not be put off by the size of this device; the SMARTmini BT is a HUGE problem solver! Plug it into you DC outlet and you will be ready to not only talk, but to charge and play music from your cell phone! 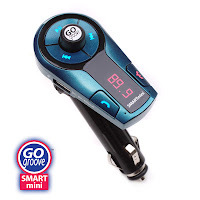 This FM transmitter can easily find any clear station for a connection. The Blueooth technology allows the SMARTmini to easily pair to your phone. With the voice-detection microphone, you can ensure that everyone can hear what you are saying. If you are playing music from your phone and a call comes in, the music will automatically fade out. Once finished, the music will continue where it left off! There is even a built-in USB charging port, to keep your cell phone or MP3 player powered when in use. The National Safety Council (NSC) estimates that 1.6 million crashes occur because of people who text and talk on a handheld device when they are driving. While the SMARTmini BT cannot enable you to text while you are driving, you can still have a conversation with your friends and family and be safe. Invest in one - it is on sale this week for 50% off with the coupon code included in the newsletter! Sign up for our weekly newsletter to receive the most-updated information on new products, special discounts, prm and more! Be mean or go green!